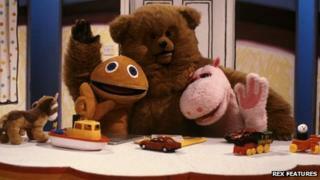 ITV is to celebrate 30 years of its children's programming by screening classic TV shows for two days next month. Programmes including Rainbow, Super Gran, Press Gang, The Raggy Dolls and Children's Ward will all be broadcast. Digital channel CITV will clear its schedule on 5 and 6 January to screen almost nine hours of old favourites each day. ITV1 will also air a documentary to celebrate the 30th anniversary. Other popular shows to be screened include Count Duckula, Art Attack, The Tomorrow People, Puddle Lane and Rosie & Jim. Drama series Press Gang and Children's Ward both won Bafta awards during their runs. Created by Kay Mellor and Paul Abbott, Children's Ward helped launch the careers of many writers, including future Doctor Who boss Russell T Davies, who wrote and produced the series. Press Gang, set in the offices of a student newspaper, was created by current Doctor Who show-runner Steven Moffat. "We are very proud of CITV's heritage and look forward to bringing back all the old favourites for this one-off, not-to-be-missed event," said Jamila Metran, CITV's head of programming. She added the weekend of repeats would "show the kids what their parents watched when they were young". Children's ITV launched on 3 January 1983 with guest presenters such as Roland Rat, Basil Brush and Timmy Mallett recording introductions to programmes. Digital channel CITV channel launched in 2006. Regularly scheduled children's programming on BBC One will end on Friday 21 December as more children move to the BBC's digital channels to watch content.